Elegant and lightweight, Robe’s VIVA is packed with smart effects that are easy to use. The fixture is very powerful yet consumes little energy. The 270W white LED light engine gives an extra punchy beam and an incredible 20,000 hours of operation – in fact, no relamping will be needed for the entire life of the fixture! Vivid and radiant colours can be applied from two colour wheels, and rotating or static gobos added for projections or mid-air effects. The smooth zoom can go out to 40 degrees at its widest and be softened it up with variable frost to create a gentle wash-like output or dynamic background projections. 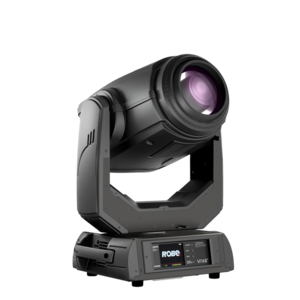 The minimum 8° zoom produces a piercing beam that can be trimmed with ultra-fast stepless iris for really punchy output, and VIVA has with extremely fast pan/tilt movement using Robe’s proprietary EMSTM (Electronic Motion Stabiliser) technology. That and much more is possible with VIVA – entertaining and contemporary!